Quilt Description: The surprising inspiration began with a metal necklace that had been sitting in a drawer for over 20 years. Since it was rarely worn, I wanted to work it into a quilt to better view and appreciate it. Little did I know when I started this project in 2004, it would begin a journey into learning more about Africa than I ever could have imagined, including an invitation to visit South Africa. My intent as the quilt developed was to show at first glance common African imagery, but then if you look a little deeper, you will begin to see some of the complex issues that many African countries face. 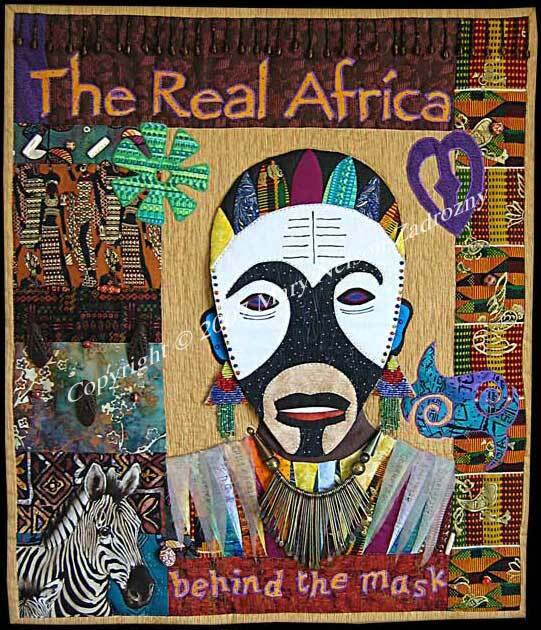 The mask actually lifts up to reveal a photo collage with some recent headlines, plus the sheer organza strips along the shoulders lift up to reveal words: AIDS, Drought, Prejudice, Child Marriage, Corruption, Apartheid, Starvation. "Behind the Mask" took 104 hours to complete. Materials: Cotton fabrics, polyester batting, heavyweight interfacing to support necklace. Embellished with beads, hand-made earrings, necklace, sheer organza fabric, buttons. Techniques: Fusible Applique, Needle Turn Applique, Photo Transfer, Hand-Quilted.